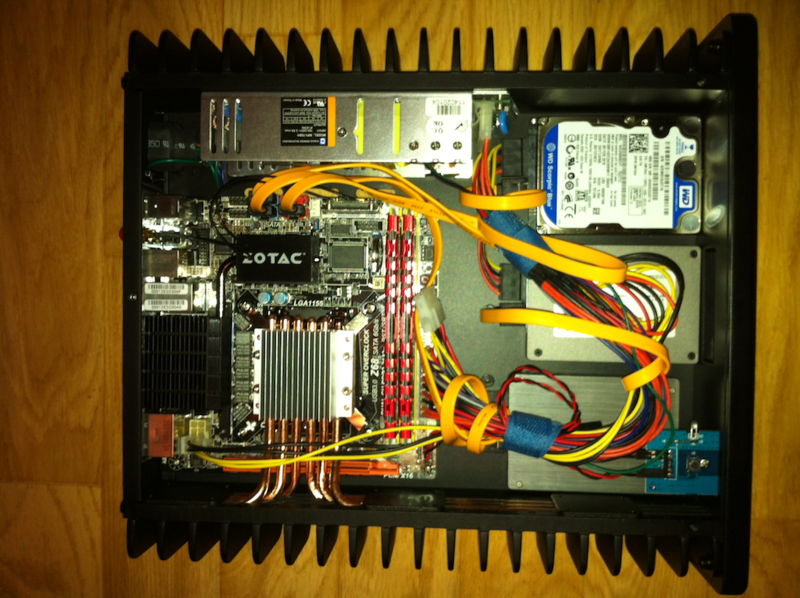 Finally had time to put my HDPLEX H3.SODD passive HTPC case together yesterday. Used an ASROCK motherboard, i3-2125 CPU, & SSD. All went well except 2 issues. 1. 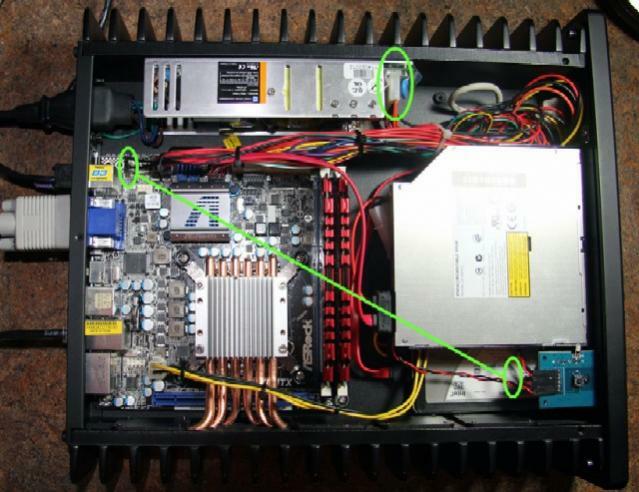 The Power & LED cables provided were just short of being able to reach the connectors on the ASROCK H67M-ITX which is on the extreme corner of the motherboard. Didn’t have any spare ones around so had to splice in a couple more inches to reach the connectors. 2. System didn’t power up. 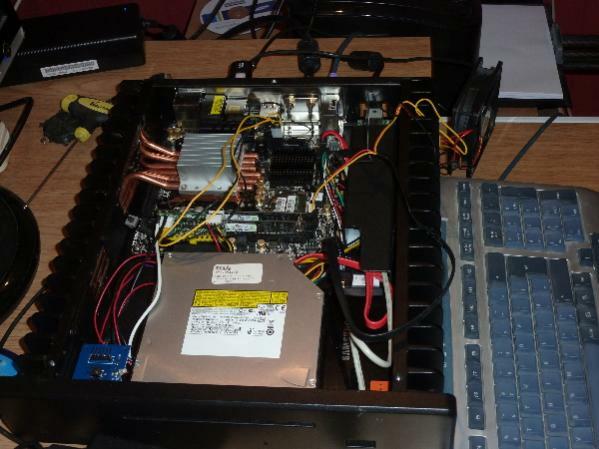 After removing un-needed components, with no success, I tried a spare ATX power supply I had and it booted right off. After a couple of voltage measurements, I found the power harness was at fault. Most of the wires coming off the 12 pin connector have a single wire which is spliced off into multiple wires. The Yellow wire was the exception where the tried to force 2 wires into the 12 pin connector. One of these wires was not making contact. I removed the second wire and spliced it in further up the wire and everything started to work. System is working fine now. Idle power hovering in the 38-42 range with 50’s under peak load. Need to finish up loading Windows 7 32-bit and hook it up via HDMI to my TV. Larry, thanks a million- no, wait, that’s not enough, thanks a billion! Everything is absolutely beautiful, so much so that I had to get my hands dirty IMMEDIATELY- couldn’t wait till Friday afternoon. Build is almost done, pics to follow within a day or two. Already powered up, and sure enough (unsurprisingly), silent. No temps to report yet since I’m still assembling last pieces, probably finishing tomorrow. Re: packaging- absolutely top notch! 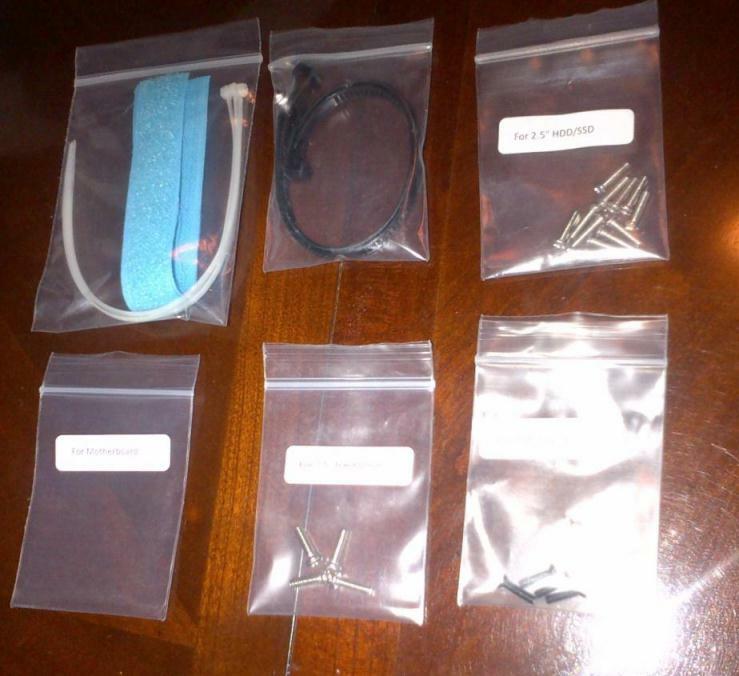 Instructions are good, each major piece is in its own individual baggie with appropriate screws so you know EXACTLY which parts are used to mount the PSU to the case, or the heatpipe securing plates to the side panel, or the heatsink to the CPU- all manufacturers should strive for this level of organization. Top-notch work again, Larry, thanks again! It’s going to run either VMware ESXi or Joyent SmartOS. Not sure yet… I still have to test a few things. Thanks HD-Plex for this great enclosure! ictures (I hope) of my build in the public album and where it will sit in my AV rack – H3 at top, current blu ray player to go to bottom. I have improved the cable management slightly since the pictures. Idle temperatures (after 1 hour of idling) are +18C over ambient (39C) which I am happy with. However, if you are prepared to stick a slow running 80 mm fan (900RPM or less) on top of case that will come down by about 3C for very little noise. If building again I would want to make a couple of changes. Move the SSD to under the blu ray (velcro is wonderful) and extend my cable management mod all the way up the right side of case for a cleaner build. Once I got all components that I ordered through HD-Plex, Amazon and Newegg The assemply was pretty traight forward. 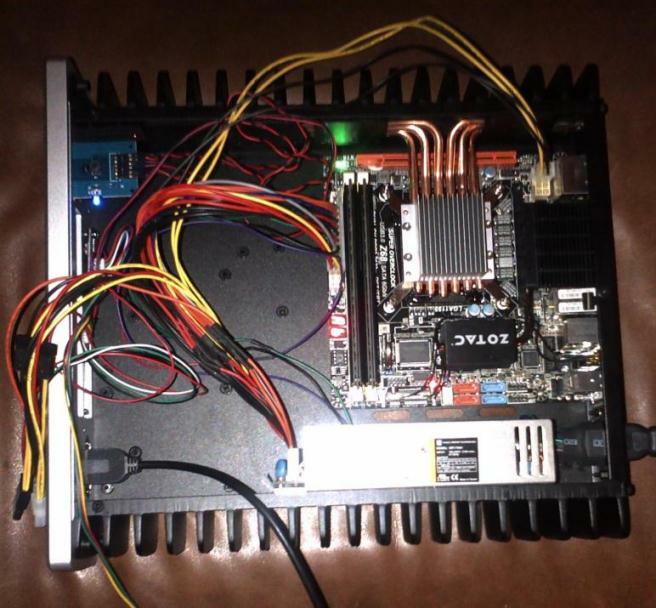 HD-Plex had good documantation on mounting the heatsink and heatpipes for cooling. After installing and configuring Win7 MCE, the biggest challange was to get Time Warner to understand what they needed to do. What I could have done on the phone with TW in five minutes (assuming I talked to a sensible person) took them 3 hours on site. Most of the time on the phone. Anyway, at the end they did wha I asked them to do and everything worked. Including the SDV. 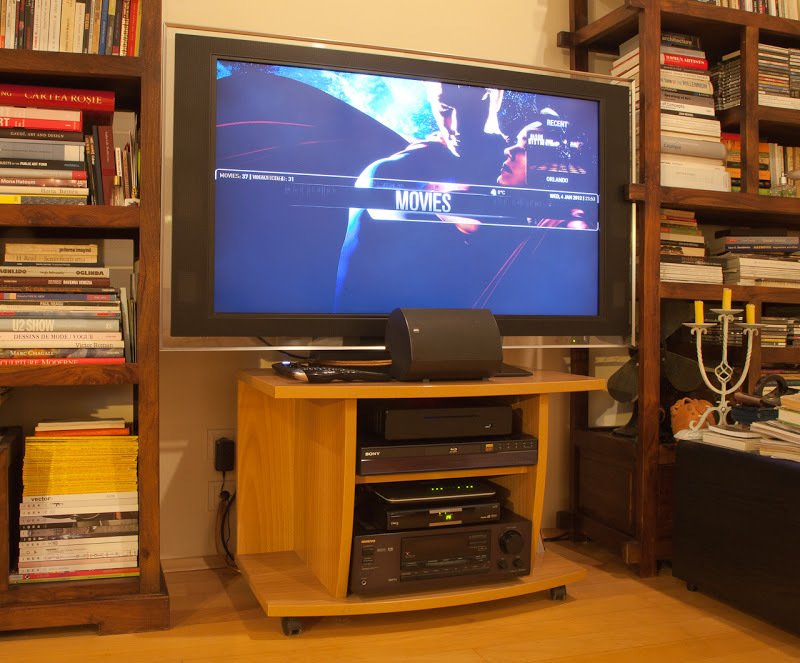 Now I enjoy up to four channels in paralell (live and record) and no noise from my home theatre. I also have a Pioneer AV receiver and Panasonic Plasma TV connected with HDMI. After a couple of weeks using this setup, the max temperature I have seen on the CPU is 58 degrees C.
My next project will be to build another system as extender for the bedroom. I can recommend this setup to anyone that can build a PC. I have changed the chipset heatskink and added enzotech mosfet coolers. Thanks larry for the support and the perfectly silent PSU you ve supplied. Got my build up and running two weeks ago. I left it running 24/7 and no problems/issues at all. 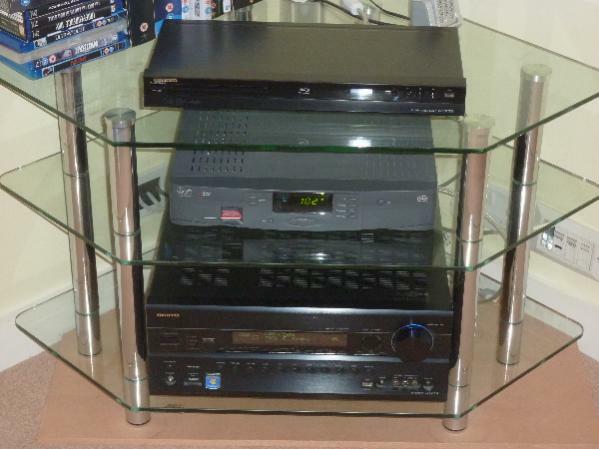 It is great enclosure – looks great, feels great (heavy, solid, like the power amps we used to build in Hi-Fi heydays). Instills real sense of pride/ownership I must say! It is going to be both HTPC (home theater PC using WMC (for now, might look at other software later)) and HA-PC (home automation PC; installed Z-wave USB controller and HomeSeer HSPRO). I looked around a lot for components so here are my choices. I have compared multiple other passive cases (Streacom, Zeno, HFX) and this one blows them away with features and even price (amazing). USB 3.0/2.0 option and internal industrial grade power supply make it really unique. I decided against internal TV tuner so this case works great – at the end now I really prefer Ethernet TV tuner as it can be shared easily among multiple PCs (wishing/hoping for Android client in the near future). Just a final post to share my conclusions if it’s helpful for anyone building a similar system to mine. In the end it looks likely that the internal 80W power supply is not a *quite* sufficient for use in this system combination and useage. It might well be fine for HTPC use, but it’s not stable under any settings for number crunching or anything requiring the GPU to work hard. I’m going to try out the PicoPSU option now, and maybe try and sell the 80W supply on ebay (or, more likely, throw it away). Good luck with your own builds! I also considered that SATA III and USB 3.0 should be mandatory. 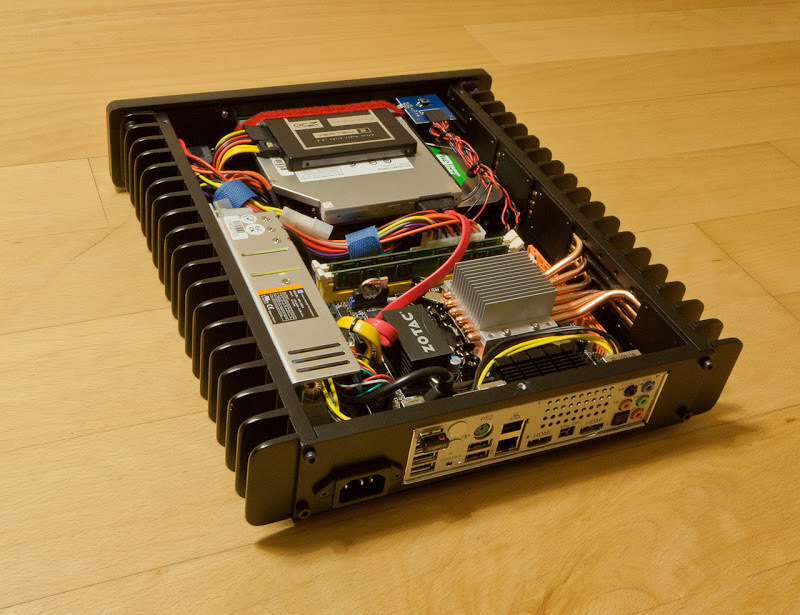 H3.SODD Fanless HTPC Chassis is a very nice case and it’s TOTALLY SILENT. I mean I have to check the power light to see if the computer is on. 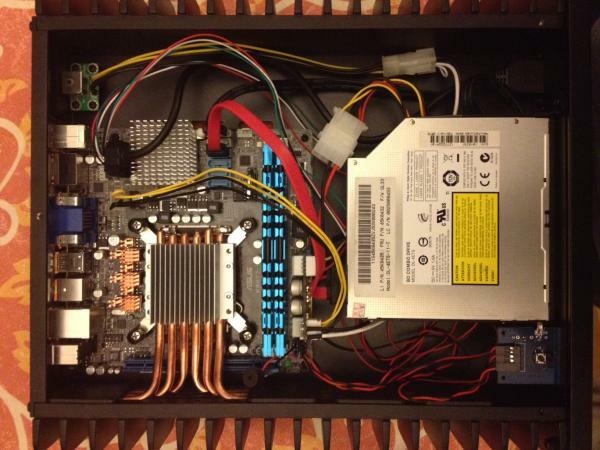 Beware that this case needs a little space around it to have a little bit of airflow. If you use it for HTPC/router purposes I highly recommend it. Also it does have a USB 3.0 port on the front which is very good (and rare). Also it is very nice. I would have bought the H3.S case (which is the same but without the slot loadind bluray) but it was not available. The Zotac was the only one I could find. Intel Core i3-2100 is also too much, but could not find in my area a 2100T in a reasonable amount of time. 2100T it’s the same proc but restricted to 2.5Ghz max freq, hence 35W. 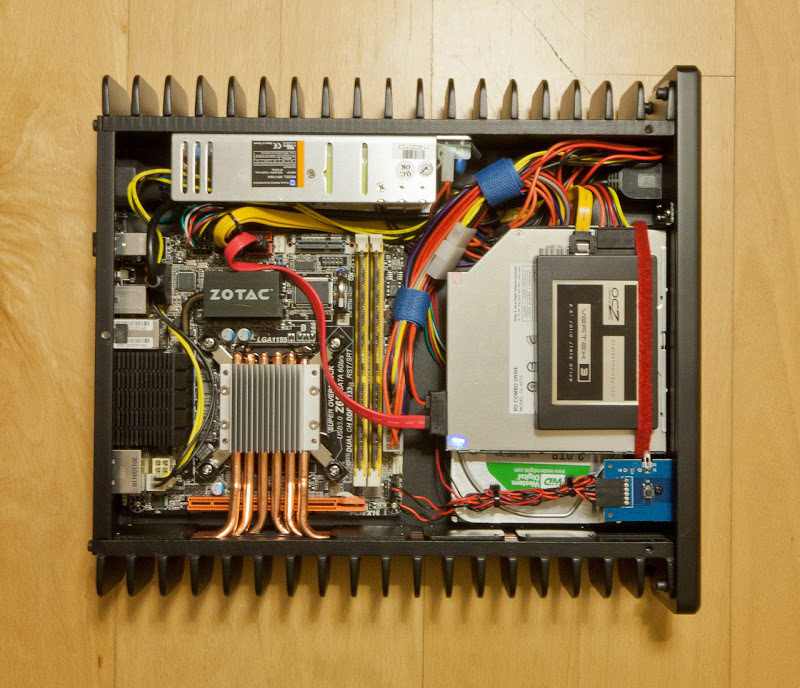 OCZ Vertex 3 is also totally overkill, because you can use the mSATA port of the ZOTAC for a smaller mSATA drive. But could not find one at the moment. system I’ll get rid of the OCZ and make a partition on the Western Digital for the Ubuntu system. I bought the blu-ray drive only because of the case. IMHO I consider that bluray distribution will silently fade away. Normally I would go with the H3.S case, but not available. All temperatures measurements at 24C ambient & WITH THE CASE IN THE CABINET AS IN THE PICTURE. Power consumption measured at the wall. 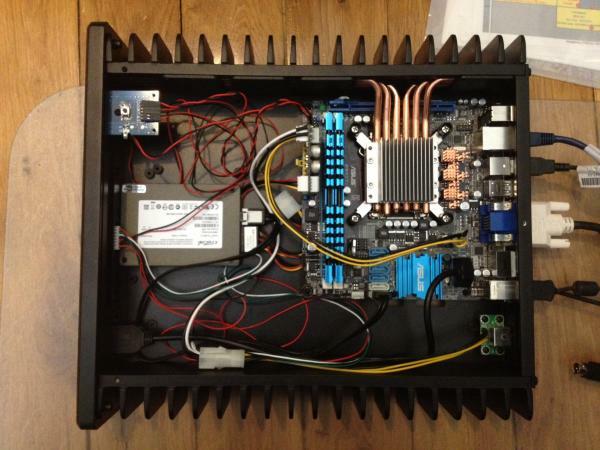 As I mentioned all the tests are done with case in the cabine with a somewhat restricted airflow. HDPLEX H1.S fanless Computer case support mini-ITX motherboard and 2 x 2.5″ SSD/HDD hard drive. In this part, heatpipe and 2.5″ HDD/SSD are explained. H1.S has symmetrical heatpipe groove on both sides, give customer the freedom of arranging heatpipe pattern based on different mini-ITX motherboard. The six heatpipes usually are installed three on each side to balance the heat dissipation task on both side of the chassis heatsink fin panel. 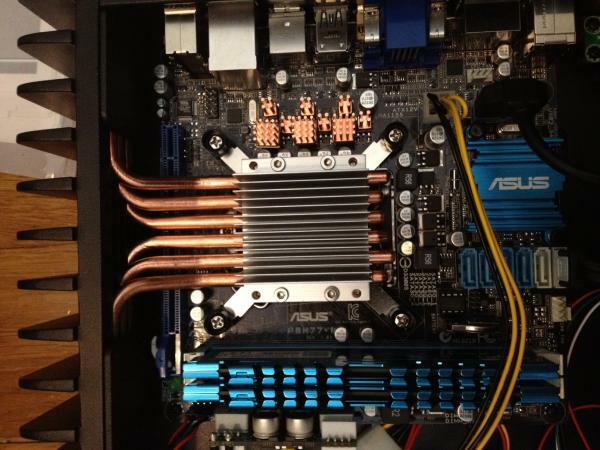 In this scenario, customer could install four heatpipes on one side and two heatpipes on the other side. Still enjoying the six heatpipe advantage in cooling CPU upto 75W TDP. 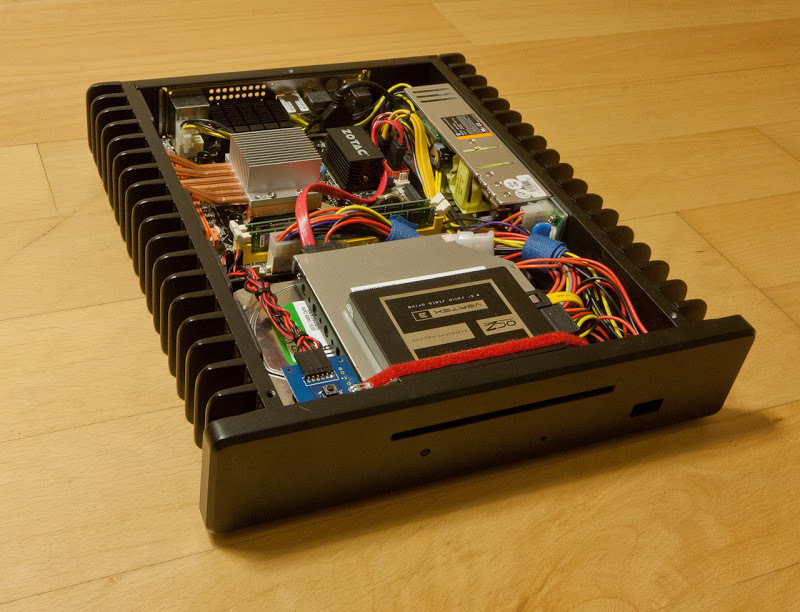 The 2.5″ HDD/SSD rack can accomdate two 2.5″ HDD/SSD. The HDD rack would be installed on the HDPLEX heatsink top aluminum cover via four M3 screws on the M3 copper post.